Another post! This makes three days in a row, not quite the norm yet here on Looking for Pemberley. I do have another book finished, so I figured, why not post about it? In an earlier post I mentioned the difficulty I was having reading books that were actually on my official list. Instead, I keep reading outliers, the books that find me, that for whatever reason, grab hold of me and make me buy them or check them out from the library. (Ok, so maybe it’s not this dramatic). 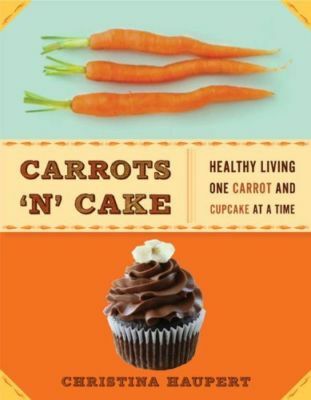 One such book is called Carrots ‘N’ Cake, by Tina Haupert, a blogger (you should check out her blog– lots of good recipes and workout stories). I just finished reading through this one, and thought I’d share my review of it here on Looking for Pemberley. If I’m honest, I was left feeling ambiguous about my reading experience at best. The writing was very episodic, and did not create a coherent story line. If I hadn’t gone into it expecting a story, I would have probably enjoyed it more. It was just like going through the blog’s archives and reading each post. Obviously since I blog and read the blogs of others, I don’t really have a problem with that writing style. Title page of my copy. However, I do see a distinction between the rhetorical situation of a blog, and the rhetorical situation of a book that is bound and printed. Call me old fashioned, but I feel like the latter requires a bit more forethought, teamwork, and professionalism. It kind of felt like a blog archive in print a lot of the time. The way the book was organized felt very disruptive, and I even have a pretty short attention span. However, there would be one chapter, that jumped all over the place in time and was hard to follow, with 3-5 recipes thrown in at the end. Honestly, the recipes should have been highlighted more. They are good recipes! The publisher, Sterling Epicure, is more focused on food than story, and the book falls into the Cooking/Nutrition genre. That being said, because there was so much text I felt like it should have been more coherent. The typeface and photo of a carrot at the beginning of each chapter were pixilated and poorly printed in my copy (not sure if this would be applicable to all copies), which just bummed me out and made the design seem cheap. Knowing how expensive publishing hard copies is, I would venture a guess that this book was anything but cheap to produce. The slightly difficult-to-see text (I also need to get a digital camera)! 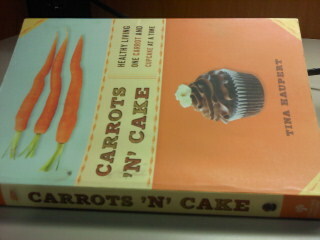 That being said, I don’t want to write a scathing review of Carrots ‘N’ Cake. I did really enjoy aspects of the book, and found many positives to it as well. I loved the idea of this book (which is why I bought it in the first place). Her whole premise is that if you eat real food and focus on holistic nutrition, using moderation in your diet and workout, you will likely become healthy. 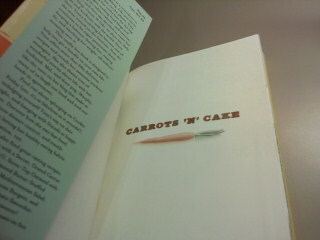 I very much like the idea of eating both carrots and cake, and have been working out a lot lately trying to get healthy, so the premise of the book appealed to me. 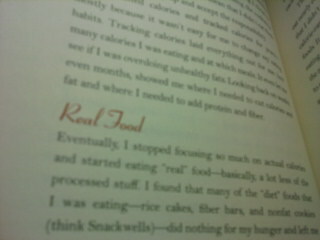 Slightly blurred subheading which reads "Real Food." She uses her personal experience, and even though she has little empirical evidence to back up her claims in most cases, she doesn’t really need it. She’s just telling her story and hoping that other people can benefit from it. I can honestly say that although the benefit for me was minimal, I did gain something from reading the book. 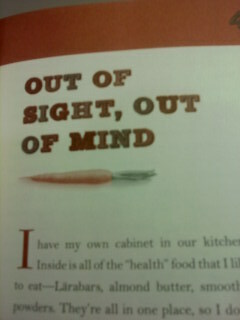 Her healthy recipes rock. I am definitely going to try some of them, and she did inspire me to get some more protein in my diet, something I struggle with. I also find exercise fulfilling, and have been doing some of the same things she seems to do (except way way less intense). So, for me, message worked. I bought her book from Barnes and Noble in the sales bin (trying to keep the Northgate one from going under), so I am not sure where it originally appeared in the bookstore, but I would imagine that you would find it close to the cookbooks. It definitely belongs there. Cover and spine, lying open on my desk. My advice would be to read the first couple of chapters, then just skip through to whatever appeals to you most. Because there is no coherent storyline, there is really no reason to read from cover to cover, and honestly, if I go back to this book for any reason, it will be for the recipes, not the text. I would not necessarily recommend this book, unless you can find it in the sales bin, garage sale, or at a used bookstore. Looking back, I can’t say that I really enjoyed it, although I also didn’t hate it. Don’t read this if you want to read something with a juicy or plot-driven storyline, and don’t expect great writing or editing. Read this book if you are interested in Bodypump and nutrition for weightlifting regimes, if you enjoy reading food blogs, and if you want a personal story with nutritionally balanced recipes. Carrots n Cake title art from Amazon books. As you can see, there is a discrepancy in her name here as opposed to my copy. I wonder if she changed her pen name in later editions? I give this book a rating of 2/5 stars, and most of that is because of errors from the publishing end, such as the formatting of the book, the editing, and the poor image quality/ lack of design. It gets one star for the great recipes, and one star because I think it’s great that Tina Haupert got an opportunity like this from blogging and I would like to support her in that success. Read with carrot cake and a protein shake, preferably after a Bodypump class. Thanks for the review! I noticed this book had been published and was curious about it. I might try to flip through it at a local Barnes & Noble. Hi Anna! Yeah, I’d say it’s worth a look, especially if you are interested in this healthy food! It’s also inspiring to see that another blogger was published. Thanks for your comment! I’ve been wanting to get her book, thanks for reviewing it! I am glad you enjoyed reading it. Thank you for your comment! Wow- Thank you for your thoughtful response. I am glad that you see the difference too- I had a hard time reading “blog posts” in book format, because I do think they have different rhetorical purposes and different reader formats. I appreciate your comment, and hope you keep reading! Good luck on the novel, and the blog as well!